The USPS believes that through the integration of traditional offline media such as direct mailing, and new online technologies such as QR codes and mobile websites, the long-term value of direct mail is greatly enhanced. The USPS is hoping that marketers will understand the benefits of such an integrated approach and re-affirm their commitment to direct mail marketing. This two percent discount can mean a significant savings for large direct mail users, and the USPS is hoping these savings—in addition to the increased effectiveness they expect direct mailers to see in their campaigns—will stimulate companies to either attempt direct mailing for the first time, or more likely, ensure those already using direct mail campaigns continue to do so into the future. This campaign is similar to the one the USPS attempted in 2011, with the main difference being that they are requiring all participants to adhere to the industry’s best practices. These include, among other things, a mobile landing page and directional copy. This is a great promotion by the USPS as it will help reduce the risk for reluctant marketers and help them see the value of using QR codes in their marketing campaigns. If you are interested in registering for this promotion you can visit their website site here. Qfuse can help users meet the USPS promotional requirements not only by generating QR codes and mobile-optimized landing pages, but also by providing the tools for encouraging a range of direct actions, such as contact forms, click-to-call, click-to-email and social engagement. 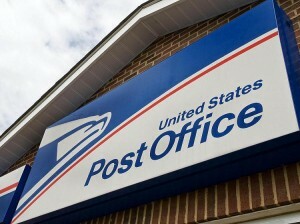 We hope the USPS and all those who participate in this promotion great success. Despite being around for 20+ years, and having many potential benefits, QR codes are only now beginning to pop up in the medical industry. The main uses of such a technology would be improved marketing abilities, information distribution and more importantly superior medical treatment and efficiency. Below are a few ways a medical facility might use this technology to improve their business. 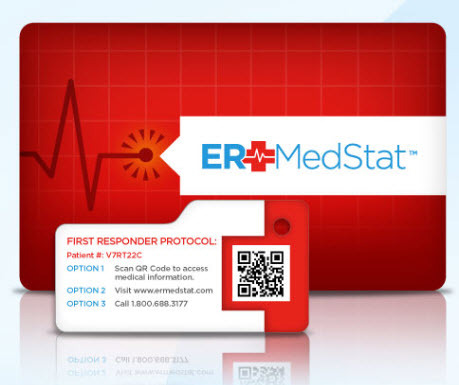 The most important potential use of this technology and a way to help reduce medical errors, and provide information to a medical provider quickly is to promote an “emergency card” that everyone should carry on them at all times. On this card there would be a QR code which if scanned would take you to important information about the individual. For example it might have a list of all known allergies the patient suffers from, what blood type they are, or any other information that a medical provider might need to know, and particularly those providers like EMT’s or ER doctors who need the information quickly. Having this information readily available in an emergency might mean the difference between life and death. A QR codes can also be used to provide various types of information to customers. For example a medical facility might hand out a refrigerator magnet containing a QR code to their customers. If it was a hospital the QR code upon scanning might provide the ER wait time. If it is was a family doctor, dentist or a similar practice the QR code upon scanning might take the customer to a landing page where they can schedule an appointment. Or the QR code might provide some information for those people coming off some surgery or procedure, so that if they have questions they can simply scan the code on their refrigerator and have most of their questions answered. There are seemingly endless ways you might use this technology to provide information and services to customers. Lastly, QR codes can be used to market your medical facility, yourself, or other medical providers. For example a dentist might provide potential customers or a local family doctor (who might send referrals) with a brochure containing a QR code, or place the code on an ad in a magazine. Upon scanning this QR code it might take you to a video of the dentist explaining his background and expertise, or a video of customers talking about their experience. It might also take you to a video touring the medical facility, or showing off some special equipment. Putting this sort of marketing material at the finger tips of potential customers should go a long way to making your expertise known and keeping your medical practice growing. These are just a handful of ways the medical industry might benefit from using QR codes, but it is always important to point out that QR codes best practices must be followed, and having the best QR code connected mobile website platform is a must. What’s better than having real, live customers who are giving you cold hard cash drive the direction of new products? Not much! The magicians at Magic Hat Brewing in Burlington, VT have yet again proven their mastery of engaging loyal beer coinsures. I recently indulged in a “secret” brew that was part of Magic Hat’s most recent variety pack. 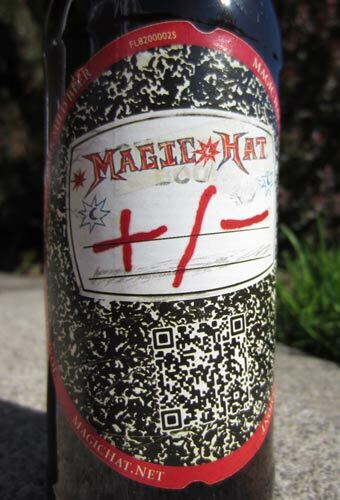 The “Magic Hat +/-” beer had the typically quirky Magic Hat branding on the label with one notable difference … a QR code craftfully embedded in the beer label’s artwork. 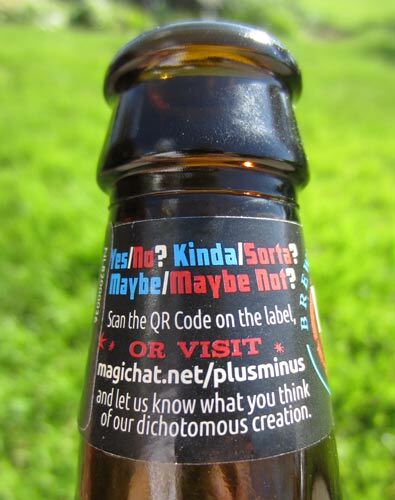 While using QR codes in product packaging is a powerful way to engage customers pre- and post-purchase, Magic Hat put a new spin on the whole concept by asking beer fans to rate the beer itself. “Yes/No?, Kinda/Sorta?”… these are some of the taglines used on the neck label to entice customers to scan the QR code and provide opinions and feedback by way of a smartphone-friendly mobile landing page. This innovative use of QR codes in product packaging is defacto using paying customers – those who are actually driving the company’s profits – to inform the direction of their products. Brilliant! Props go to Magic Hat for such an amazingly creative and well-executed use of QR codes. Keep the fun QR code ideas and cold brews coming! Have you come across an interesting use of a QR code in product packaging? We’d love to hear about it so please share below. QR codes are all the rage right now and they should be due to their usefulness in marketing and information sharing. But for many people currently using QR codes they seem to think the QR code is an end in itself, this could not be further from the truth. A QR code by itself is boring, and often companies connect this boring 2D black and white bar code to a just as boring and hard to navigate desktop website, all the while feeling as though they have presented the world with some great accomplishment. Well sadly they have done no such thing, instead they have only wasted their time and money, while wasting the time of the unfortunate customer’s who chose to scan the code. 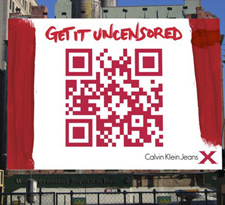 A QR code is only as useful as the advertisement convincing the consumer to scan the code and the content the code is connected to. If you can’t convince the consumer to scan the code then it doesn’t matter how good the content is, no one will ever see it. If you can get the consumer to scan the code but it takes them to a boring, hard to navigate, or irrelevant landing page, then it is of no use if they see it as they won’t be sticking around very long to make your QR code investment worth it. A solid marketing strategy must be used to convince your targeted consumer to scan the QR code. Whether this is through promising some reward, interesting content, an interactive experience, a special deal or simply dressing it in pretty colors, it does not matter, just make sure you have convinced the consumer that it is worth their time to pull out their phone and scan the code. Once you have figured out how to convince the consumer to scan the QR code you need to make sure you have content that will keep them interested and complete whatever goal you hoped they would achieve by scanning the code. It is important that your landing page be mobile friendly, which often means paying for individual mobile website development. You can limit this expense by subscribing to a company that provides a mobile web site creation platform to ensure you can create many mobile sites at a minimal cost and that are already connected to the QR code. From here it is simply about creating the relevant content. For example, if you wish for the visitor to complete a purchase, perhaps you might offer a discount if they make the purchase from the mobile website, or perhaps you reward the visitor with a coupon if they agree to send you their contact information, or maybe you offer them a sneak peak at a newly released movie trailer. Just make sure the content is relevant to the pitch you made to get them to scan the code in the first place. Only when both of these facets of the QR code are mastered will the use of this technology be worth the resources spent.